Egon Seconds of South Africa has been appointed to referee Sunday's final of World Rugby's Under-20 World Championship between England and France. This is a great achievement for the Capetonian who went from being a top player to become increasingly acknowledged as a top referee. He is one of an increasing number of top players who have become referees. These include Glen Jackson and Nic Berry as well as Damon Murphy, Jamie Nutbrown and Karl Dickson who are also at the Under-20 Championship in France. Seconds started playing rugby at Voortrekker High School in Kenilworth and went on to an illustrious career as an exceptionally speedy wing in Super Rugby for the Stormers, in the Currie Cup for Western Province and in the Sevens Series for the Blitsbokke. Retired from playing, Seconds was approached by Mark Lawrence, a former Test referee still much involved in the structures of South African refereeing. It took a while for Seconds to take the refereeing plunge. 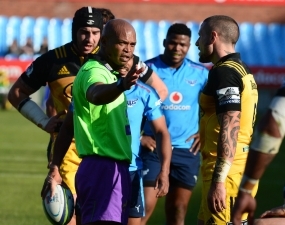 In 2014, aged 33, Egon Ryan Seconds joined the Western Province Referees; Society and in a short time he has climbed to Currie Cup, Super Rugby and Test level. Now there is this affirmation of the refereeing ability of Egon Seconds. The last South African to referee a final was Jaco Peyper in 2011. Peyper is now involved in the Test series between Wales and Argentina in Argentina. The final will take place at Stade De La Méditérranée in Béziers, kickoff at 19.00 local time.